Les Redmond is perhaps best known as the designer and constructor of the Gemini Mk2 Formula Juniors produced by the Chequered Flag Engineering. Les produced more than just the Gemini design; he was responsible for a number of racing cars, over a period of almost forty years, for a variety of classes and constructed under a number of names and invariably being competitive. 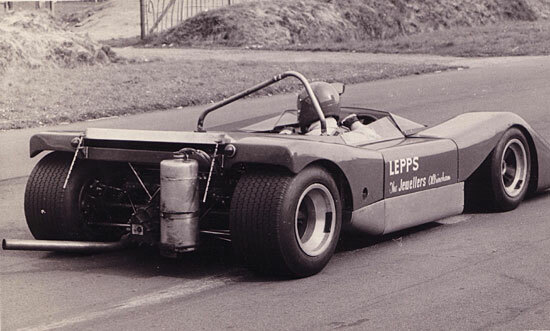 Les, usually designed and constructed these cars for others, sometime a single racing driver, at other times for somebody who had aspirations of having a racing team and required cars to compete with. 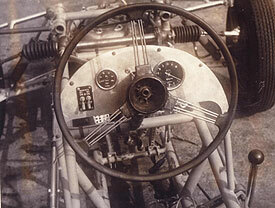 While not recognised as a racer himself, he competed at times in single seater and later in minis. Primarily he was a designer and engineer. Leslie Redmond was born in March 1928 in Hackney London, the third of the five children; three boys and two girls that his father John and mother Florence were to have. Father, John, born 1898 in the East End of London started work delivering bread in the City Of London on a horse and cart but in 1929,soon after Les was born, the family moved to Southall, Middlesex which at this time was still in the country. By this time John had moved on from being a carter to being a qualified Electrician. Les’s mother, Florence but known as Dolly was also born in the East End in 1895. It was in 1951 when both Dolly and John were to return back to their roots in East London in 1951, where the became and remained Publicans until Dolly’s death in 1958. Les did his schooling in Southall and attended Ealing Technical Collage before undertaking his two years military service in 1946-1948. For a period after the army he worked for Frank Barry as a photographer, and this is undoubtedly where Les developed a keenness for photography; an interest he was to retain up until his death. Whilst employed as a photographer Les meet his future wife Joyce, who was on the stage. After marrying they lived in a flat above Joyce’s father’s shoe repair business and Les moved onto a job at Grove Motors as a foreman. As well as working for Grove Motors, Les and a mate Curly Goddard used to buy, sell and repair cars on the side so as to supplemented their incomes. Les nephew noted that “I wouldn’t think you could describe the cars as luxurious as he once bought a boxer dog, left it in the car, someone had nicked the dog and left the car” As it often is for a newly married couple and for every one soon after the war, times were tough and Les and Joyce had to sell there own car at one time so he and Joyce could eat. 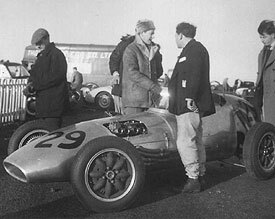 Though not much is known about the competition history of Les first car, going by the date on one of the photos, the “Special” for lack of a name, was constructed while he was at Grove motors in 1948 for what we think was the new 500cc F3 class. Front engine, it utilised an air cooled flat twin motor that we have not been able to identify and could well have been designed and built by Les using components that were available to hand. Coupled behind this was a Morris Minor gearbox cantered to around thirty degrees with remote gear linkage, driving to the rear live axle. Front uprights and suspension arms were Morris minor as was the rack and pinion steering. The car while utilising a conventional live rear axel, the rear suspension was revolutionary for 1948 in that the rear end was by coil over shock absorbers mounted inboard and operated by rocker arm top link. Unfortunately no photos exist of the car with the body and it’s not known if the car was ever run. By 1952 Les had became mates and business partner with a light weight boxer Danny O’Sullivan. Danny was beaten in 1963 by Ronnie Clayton fighting for the British Light weight crown. Les had always liked boxing and Danny used to train both Les and his two bothers Micky and Dennis. The three of them were good enough that they would go to the fairground boxing booths and knock the living daylights out of the professional boxers in the ring to earn the 5 pound prize money. 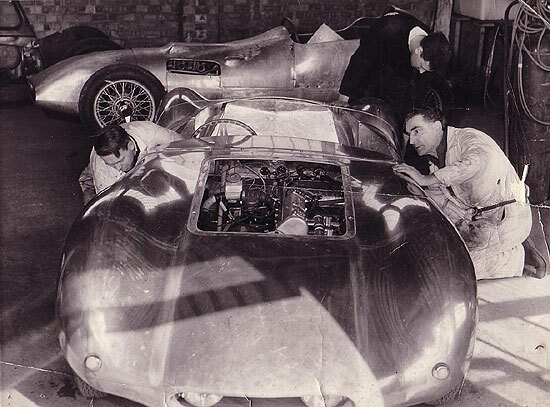 In 1954 Les began working for Aston Martin, in the competition department. At the time Reg Parnell was Racing manager for the Aston Martin Racing team and it was here that Les would have made many of the contacts in the motor racing world, some which were to continue through his subsequent design life. Whilst here, Parnell had given Geoff Duke a trial, but didn’t use him. It would have been at Aston Martin where the three of them, Parnell, Duke and Les first met. Les involvement with the competition side of race cars at Aston included a spell working with Roy Salvadori. Les, probably thru Salvadori, then had in his words “some association” with Cooper cars. It was around about 1956 when Les’s first met a couple of racers, Jack Alderslade, the son of a wealthy man, and Brian Spicer through a distant relation. Les having competition experience began looking after their racing cars and accompanying them to the practices and the circuits. It was at one of the practises an incident occurred when they were testing at Silverstone, where if Les hadn’t lifted his legs up a moment before, he would have lost both his legs as Alderslade crashed into the pit wall. Both Alderslade and Spicer were to be involved in Les next venture; The Moorland. 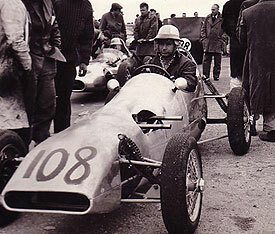 The Moorland (Mk1) was drawn up and constructed by Les in 1958 for the new Formula Junior series. It was in this and the subsequent Moorland Mk2 that lay the origins of the later Gemini Mk II Formula Juniors constructed by Les for Graham Warner under the Chequered Flag banner. 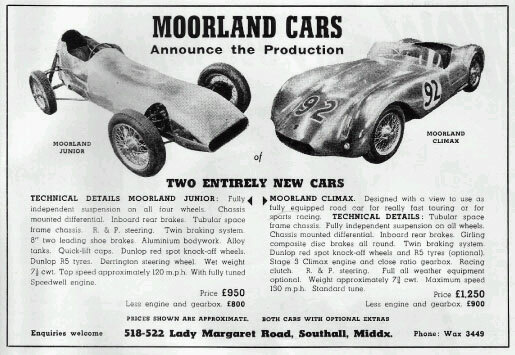 At the same time a pretty Moorland Climax Sports Racing car, the Moorland Climax was constructed along side the Moorland Junior and both were seen to be advertised in an April 1959 publication. 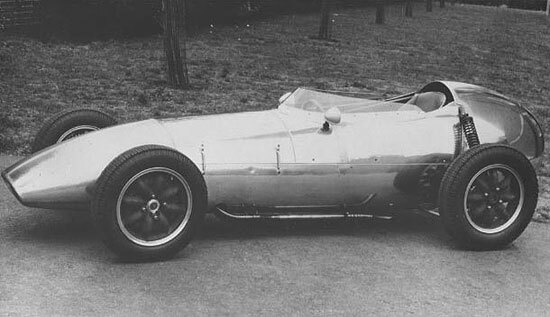 The Moorland Sports Racing car, clothed with an alloy body from Williams and Pritchard, a company that Les was to have along association with, was first seen competing at the Goodwood circuit at the Easter meeting in April 1959 with Chris Bristow at the wheel. The space framed car using a 1100 Coventry Climax, was unfortunately to retire with engine problems. Moorland Sports Car. Goodwood. Les, Mike Moore back to Camera and Chris Bristow, Rgt. CR Les Redmond. 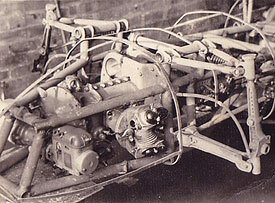 The Moorland FJ also of space frame construction, used fabricated wishbones, again with W & P alloy body. A report of the day described the car as ugly, but it was more that FJ was in its infancy and the body was more reminiscent of the early fifties specials. Both the FJ and Sports Racing car were constructed by Redmond in a lock up behind Moreland Motors, a small car showroom owned by Mick Moore on Lady Margaret Rd, Southall while Les lived close by at 257 Lady Margaret Road. The Moorland undoubtedly took its name, either from Mick Moore or from the establishment it was built behind. Whilst Moore accompanied Redmond to early testing at Brands Hatch of the FJ and the Moorland Climax at the Goodwood event , it’s not known if he had any financial involvement in the project. 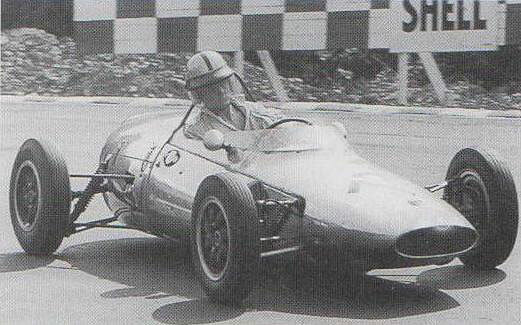 It’s quite possible that financial backers of Redmond in the Moorland projects were Brian (Jack) Alderslade, and Brian Spicer, on the basis that they would get a drive at Monza and Monaco of the Formula Junior. Moorland Mk 1, Jack Alderslade testing. CR Les Redmond. The Mk 1 having been finished in April 1959 and after some testing was entered and briefly run in practise with Brian Alderslade at an event at Snetterton on the 15 April During this time Les began construction of the second Moorland. 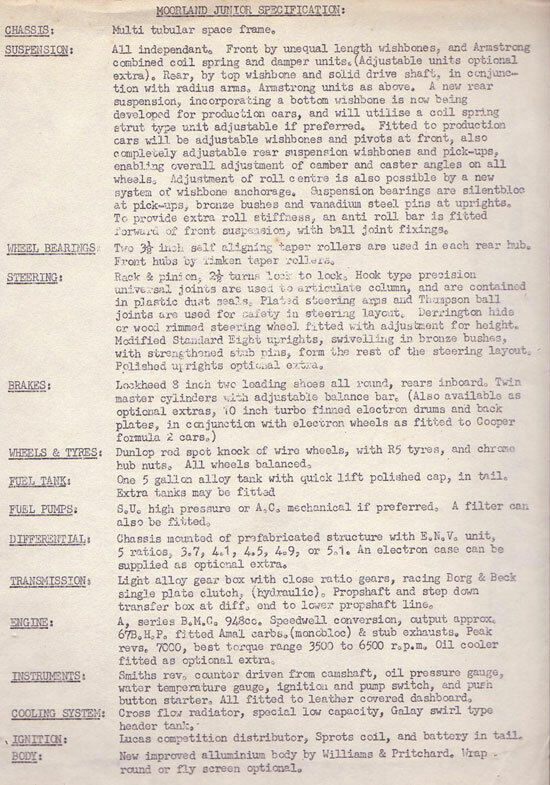 Les had proceeded to work in earnest on a second Moorland FJ which was considerably different both in appearance and in construction to the original Moorland, with the two Moorland FJ cars being entered for Monza and Monaco with Alderslade and Spicer as the drivers. It was clearly too late to get the cars available in time and both were entered as DNS. Les family suspect that Alderslade and Spicer then withdrew financial support and that left Les Redmond in the position of being unable to fund the project. The Moorland (Mk1) again competed in the 12 July 1959 Brands Hatch BRSCC meeting, this time under the stewardship of John Hine Cars Limited with E L Hine as driver. Nothing has been seen or heard of the car subsequent to the car being driven by Hines hands though ironically the Moorland badge was found along with a Gemini Mk2 chassis plate by HRSCC Club Member, Ian Garmey in the 1990’s in a display cabinet at Horopito Wreckers Yard in the central North island of New Zealand. Les having completed the Moorland MK2, entered the car , #150 for the 3rd August 1959; Brands Hatch, August Bank Holiday meeting, with the car winning the 5 lap FJ division with Ian Raby as driver. 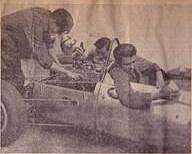 Graham Warner was at this time in negotiation with Redmond on taking over the Moorland design and by the 12th or 21st August the Autosport magazine was reporting that Warner of the Chequered Flag Garage had acquired the Moorland (the second car) from Les Redmond and formed a new company, Chequered Flag Engineering with the new car, to be called the Gemini, after Warner’s birth sign. Warner also acquired, the design rights, all jigs and moulds along with Redmond’s services as designer. It is also variously reported that Warner acquired a second incomplete car, possibly the beginnings of what would become the first of the Gemini FJ Mk2. Les Redmond’s next year of his motoring life were spent in the services of the Chequered Flag as Chief designer. Les was joined by Warner’s race mechanic, a New Zealander, Brad Ward who also doubled as car constructer. Ward had been working at the Chequered Flag garage and was responsible for taking Warner’s un reliable Lotus Elite, LOV 1 and turning it into a formidable and successful sport racing car. 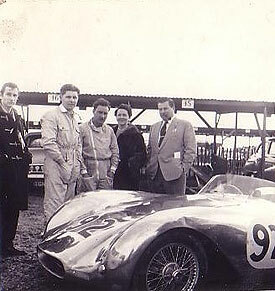 Les was soon joined by his young nephew Derek Taylor, Roy (Tom the Weld ) Thomas who was later to form with Charle Lucas; Charles Lucas Engineering, Limited (CLE) and build Titan race cars. The Moorland Mk2, now rebadged as the Gemini Mk1. Chequered Flag publicity photo. The Moorland, (Mk2) now re-badged as a Gemini (Mk1) and appeared as such at the Brands hatch meeting on the 4th September 1959 taking a win and fastest FJ lap on its debut. In this time, Les had proceeded to design and build the first of the Chequered flag built Gemini, the Mk 2 which was entered along with the Moorland/Gemini Mk1 for the Brand Hatch meeting on the 4th of October 1959. The Gemini, entered for Warner was only completed the night before the race, but at the last moment Ian Raby who had been entered in the Moorland/Gemini Mk1, took over the drive of the Gemini Mk2 as Warner could not make the event. Gemini MK 2, the first car. CF publicity photo. 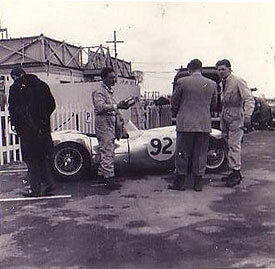 Both cars were then despatched to the USA to take part in the 1959 Sebring Formula Junior race. 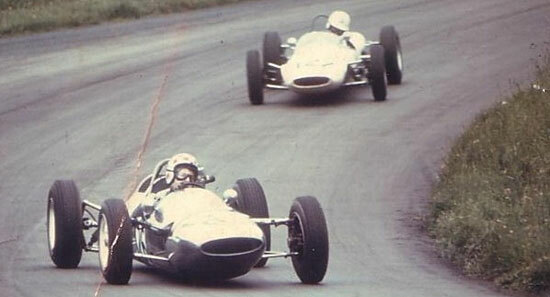 The Moorland Mk2/Gemini Mk1 was race in the hands of Dr Irv (Ike) Maxwell on behalf of the private owner. The car was entered and completed under the Moorland name. The Gemini Mk2 had been despatched to the USA Gemini agent Bill Tannehauser. The next major meeting for the Gemini Mk2s was the Brands Hatch boxing day meeting in 1959 where one of the Gemini Mk 2 was to have the distinction of becoming Jim Clarkes first single seater drive and the car driven by Graham Warner, the first Formula Junior to use the Ford Cosworth 105E motor. It is understood the The Chequered Flag team were to produce thirty of the Mk 2; four with Ford Cosworth engines and the remainder with the BMC A Series 1000cc motor. 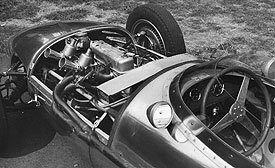 By early 1960 it had become more and more apparent that just as the front engine cars were outclassed in Formula 1 racing, the same situation was occurring in Formula junior. 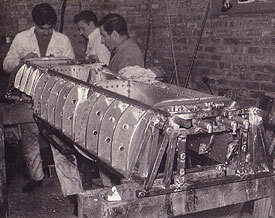 The Chequered Flag, constructors of the Gemini Mk 2 Formula Junior had in July, begun to build the first rear engine Gemini, designated the Mark 3. 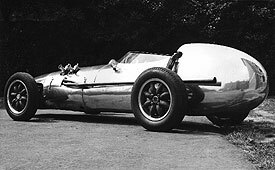 The Mark 3 had a completely new design of space frame with the alloy body manufactured by Williams & Pritchard as had been the Mk2. An extremely low rear mounted Cosworth -Tune Ford 105E engine was coupled to a four speed Renault Dauphine Gordini gearbox. 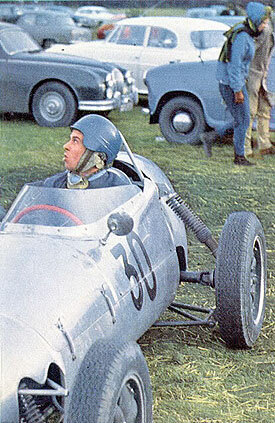 The first outing for the car was a demonstration to the media with Geoff Duke driving. The competitive debate for the Mark 3 was on the newly extended 2.65 mile Brands Hatch Circuit in the August Bank Holiday meeting with Sir John Whitmore at the wheel. Despite spinning when his feet became entangled in the pedals, the car handled exceptionally well and despite a wet and greasy track Whitmore recorded some excellent times. The next event was two weeks later on the 20th August; The British Automobile Racing Club organized meeting was held at Goodwood. In view of the large entry this was comprised of two seven- lap heats, the twelve finishers of each heat going through to the 21 lap final .Tony Maggs who had driven a Front engine Mark 2 in the earlier Brand Hatch event was down to drive the Mark 3. Mike Beuttler of the CF takes over the storey: “Practicing went very well for the Mk 3 (recording third fastest time in the heat) putting Tony Maggs in the Gemini on the front row of the grid in 1 minute 35 seconds between Trevor Taylor and Peter Arundell. The car had gone beautifully throughout practice and it was a heart-breaking blow to all our hopes when as the flag fell, Tony was left on the line as the starter had refused to engage. After a push-start he drove like one possessed, setting up joint fastest lap with the winner, Trevor Taylor, in 1 min, 34.2 seconds, well inside the previous F.J. lap record. All this was to be of no avail as the car had been disqualified for receiving a push-start which of course is against Junior regulations.” Les Redmond was visibly upset despite being consoled by Jim Clark. One week later on the 27th August, the Mk3 was back at Brands Hatch circuit taking part in the John Davy Trophy “Kentish 100 organised by the B.R.S.C.C but this time in the hands of Geoff Duke. 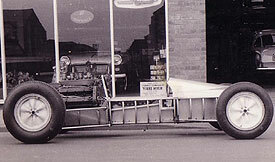 The car was to finish tenth in this Geoff Dukes first drive in the rear engine Gemini. Geoff Duke was to also pick up the drive at the British Empire Trophy meeting at Silverstone on October 1st but the event was run in the worst possible conditions. ; a drizzle started as the cars assembled on the grid and had deteriorated to a steady downpour soon after the start such that only the first two rows of the large field of Formula Juniors was visible as they splashed their way into Corpse Corner, the remainder of the field being hid behind the spray. In the pouring rain and with large pools of water laying about the circuit, the race was led from start to finish by Henry Taylors Lotus 18, followed by Peter Arundel. Coming in third and catching Arundel at a rate of two seconds a laps was Geoff Duke when he hit one of the pools of standing water coming out of Maggots Curve, lost the car in a big way and disappeared backwards. With only two meetings left in the season the team decided to concentrate solely on preparation of the Mark 3. The first being the John Davy trophy at Snetterton circuit on October 9th with Tony Maggs down as driver, followed a week later on the October 16th by the BRSCC National meeting at Brands Hatch Circuit again with Maggs driving. 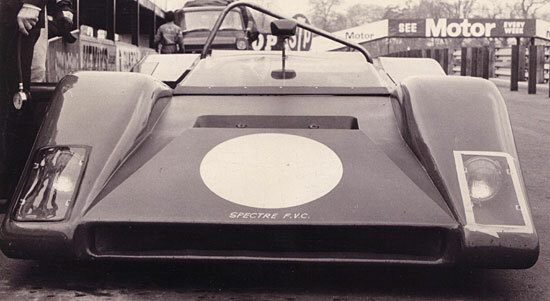 The final meeting for the Mark 3 was to be the ever popular B.R.S.C.C’s Boxing Day Brands Hatch meeting and for this two rear engine Gemini’s were entered; The Mark 3 driven this time by Peter Ashdown, and the first appearance of the new Gemini Mk3A built for Mike Parkes to drive. The Mark 3A had been considerably improved with the extensive circuit testing and development work carried out on the prototype Mk3. 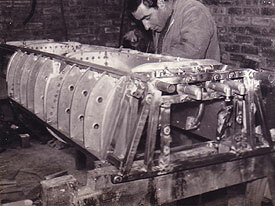 The Mark 3A had been built from scratch in four weeks. 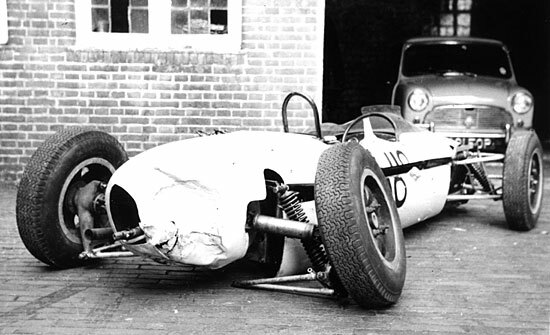 Mechanical maladies were to affect both cars with Parkes gear lever coming adrift on the second lap and he was limited to changing gears by pulling and twisting the gear change rod. Despite this he was still able to lap very fast, finishing a credible third behind Arundell in a Lotus. Ashdowns Mk 3 whilst suffering from bad clutch slip thru practice and the race, still set up the fastest lap time and a forth placing, in a car that he had not driven before. Ashdown was to say later in a 1986 Motorsport article that “he remembered the Gemini Mk 3 as the best single seater he ever drove”. Mike Parkes in the new MK3A leads Peter Ashdown in the earlier MK3 at Brands hatch Boxing day meeting. CR LAT Photography. Thus the Chequered flags season with the Gemini Mark 3 finished with a first, a third and a forth and three fastest laps. However with the development of the Gemini MK3A the Mk 3 was sold privately to the USA. By February the Gemini Mark 3 was now in USA in the hands of Charlie Kolb and the cars first outing was at the Sebring 12 hours on March 24th 1961 in new White livery with black stripe. The USA debut began well with the car easily winning at Sebring in the face of a very large field and strong opposition. Kolb lead from start to finish and was out to a two lap lead by the end of the race with Walt Hansgen 2nd in a Cooper T56 BMC, Ronnie Hissom 3rd and Jim Hall 4th , both in the new Lotus 20 Fords and Pedro Rodriguez 5th in the prototype Cooper T56 BMC that had won the Carrera Gran Primio in Mexico DF earlier in January in the hands of his brother, Ricardo Rodriguez . Ricardo piloted his OSCA to 9th in the Sebring race. The next outing for the Gemini was the following month at the Governors Cup race at Marlboro Raceway in Maryland on April 16, with Kolb coming away with another first. The car continued to race with Kolb through 1961 and 1962. 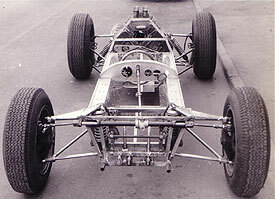 The Mark 3A was based on the Mark 3; the chassis was further stiffened and also slimmed down. The car was again equipped with a Renault Gordini gearbox with some cars equipped with boxes modified to a five speed close ratio. 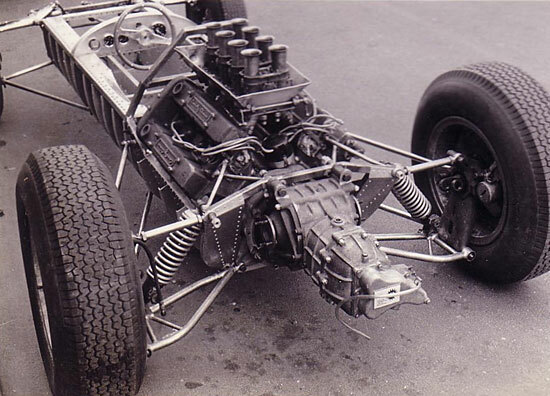 Suspension was much the same as for the Mark 3 but track and wheelbase were increased, a new rack and pinion made. 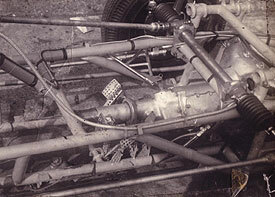 Whilst the first Mk3A was fitted with conventional 10 inch drums on the front for the boxing day meeting as per the earlier Gemini Mark 3 and Mark 2 cars, braking power for the subsequent 3A’s was an completely new design with the ten inch liner cast into the finned rim of the wheel which improved un sprung weight and braking. Rear brakes remained the same as per the Mark 3A being inboard eight inch Elfin drums. Outwardly the most noticeable change to the cars was the body lines with the tail having a lower flatter profile and the upper front body section centre lines horizontal with the now rectangular fuel tanks. Individual Fuel fillers on each of the twin pannier tanks of the Mark 3 being replaced by a single central filler in front of the dash and the anti roll bar being moved from above and to the rear of the front suspension, to lower down and in front of the wishbones. 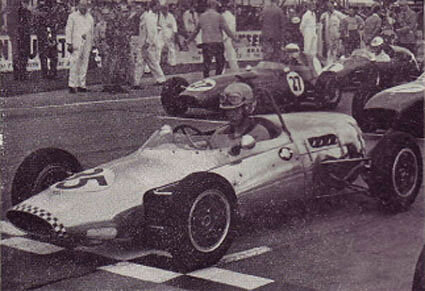 However Les and Warner did not really get on and so by late 1960, Les and the Chequered Flag had parted company. Initially Les did not move to far afield, as for a time after he left, he was to be found designing and building in the lockups opposite the Chequered Flag lockup. 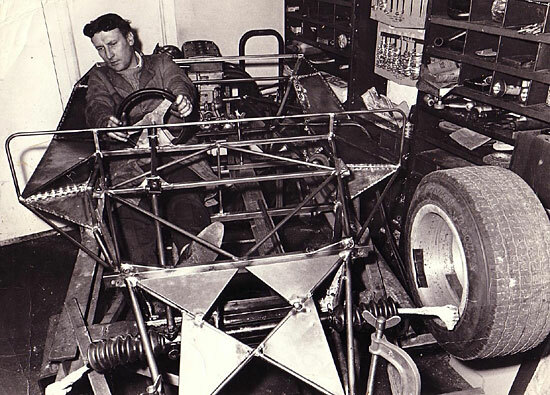 Tom Hawkes , a wealthy Australian, who had built for himself and driven a Gemini Mk2 for the Chequered flag, had at this time formed his own company; Competition Cars of Australia, and begun constructing his own FJ cars, also in a lockup opposite the Chequered Flag premises. 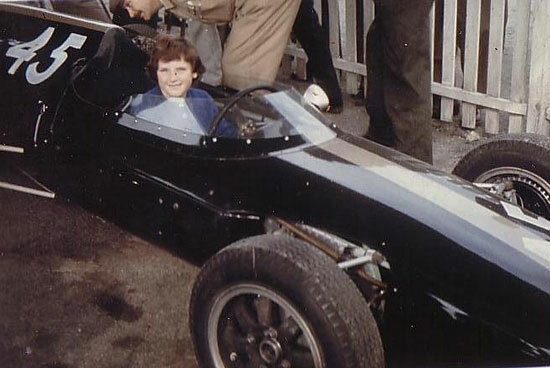 Initially named the Tomahawk and later Ausper’s, Tom the Weld now ex the Chequered Flag was now construcing chassis for Hawkes and Les – may well have been working for Hawkes on the Auspers, whilst also working in his own lockup, on the start of other Formula Junior projects. 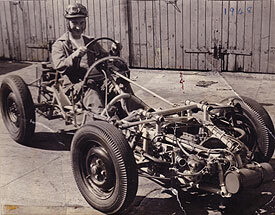 Les would continued to design and build a number of race cars up until 1970 and the first of the designs Les produced after leaving the CF was the Heron FJ. The car, was a rear engine Ford 105E design, apparently based on the Gemini Mk3 that Les had just completed for the CF, but in this case it was designed for Sewell & King of Chelmsford with Jim Diggory having some involvement. 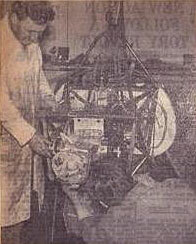 Diggory, a garage owner and racing car driver ran the Imperial Garage in Rhostyllen, Wrexham, North Wales and held the Volvo and Vw agency for the district. He raced in Frazer Nash, Marcos, Lister-Jaguar, Cooper Monaco and Aston Martin DBR2 and successfully competed in National sports car events, winning 9 races 1960-63. 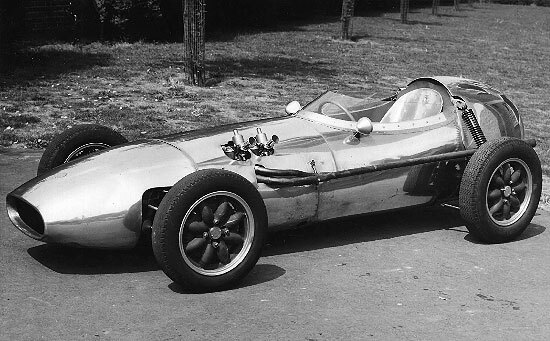 The Heron re-engined with a Climax engine subsequently went to South Africa with a young Tony Magg’s, and then again re engined with an Alfa Romeo and as such took part in F1 races in the Republic. The next project to be designed by Les was sold to Jim Diggory whilst still under construction and was ultimately completed at Diggory’s Imperial Garage in Rhostyllen Wales. This car was to become the Gwyniad, a most attractive space frame car of rear engine construction with 105E Cosworth Ford motor of 1100cc. The car was up and racing by April 1961. The Gwyniad FJ is named for a fish, they say is over 10.000 years old that can be found in the Bala Lake in North Wales. The two Works Gwyniad’s built, were estimated by Diggory to have cost around 2500 pounds each. Both were constructed with alloy bodies and both painted a creamy yellow colour with a black stripe running down the middle of them. The cars differed slightly in construction, and the first was fitted with VW transmission and the second run with various Renault or VW trans axle. Gwyniad FJ and Les Redmond. CR Les Redmond. The two “works” Two cars were initially entered, for Chris Meek, and Bruce Halford. 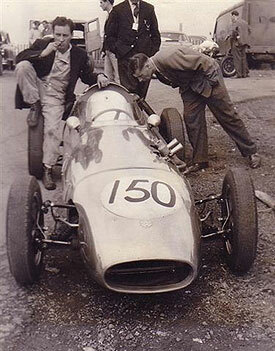 Meek appeared at Oulton Park (15/4/61), Aintree(22/4) and Silverstone(6/5). Meek was to last one lap at Oulon Park, Halford who was on the 3rd row of the grid at Silverstone, finished 14th, one lap down. At Oulton Park (13/5) George Pitt put the car on pole but retired after 1 lap. Diggory and Gilbert Baird also drove the Gwyniad at times during 1961, with what looks to have been the second car, being sold to Baird in Mar 1962 for 1250 pounds, and then onto John Greenwood. The car and Greenwood were both badly damaged, when stationary on its trailer in June of 1962, the car, trailer and Greenwood were struck by another vehicle. Greenwood constructed a BMC engined F3 in 1964 and whilst the fuel tanks, centre body section and steering wheel were used on Greenwoods F3, contrary to reports, the Greenwood car was not constructed from the Gwyniad and the second Gwyniad works car still exists to this day. Joe Sharps, a 22 year old Welshman from Plas Ifan, Northop, purchased the third Gwyniad painted yellow with white flash. Accompanied by his mechanic, Alec Bridger from Ewloe, Sharps intended contesting the European FJ circuit. Sharps started 28 April at the Nurburgring, then intended moving onto France, Belgium, Austria, Italy and finishing up at a meeting in Sweden, but the car was unfortunately crashed at Monza , resulting in Sharps ending up in hospital. Sharps had, had intentions of installing a twin cam but the car was instead sold in a damaged condition, to a Manchester garage owner, who repaired it and raced it, somewhat unsuccessfully. Maurice Jones owned the car about 1965. The car was crashed again, and again sold in a damaged condition and then sold on again. Les initially travelled up and back from London to Wrexam to complete the Gwyniad but the location must have attracted Les and Joyce as it wasn’t that long after that the family moved to Wrexam to live. 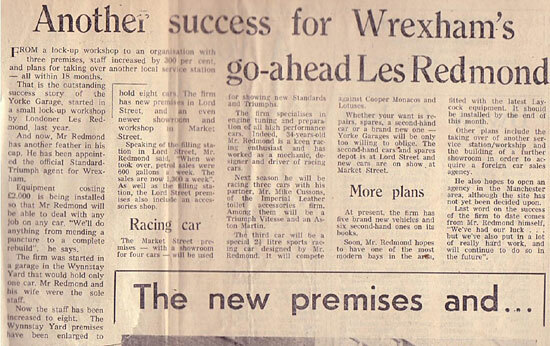 With in eighteen months of moving was , Les now 35, partnered with Mike Cussons of Imperial leather and soap concern moved from the small single car lock up garage in the Wynnstay Yard were he and Joyce were the sole staff, to a larger garage and showroom still in Wrexham where he now employing eight staff . Les’s Yorke Motors retained the Wynnstay yard site which was enlarged and held eight cars, but now involved a Petrol filling station, parts department and second hand car sales in Lord St, and a further new car showrooms in Market street. 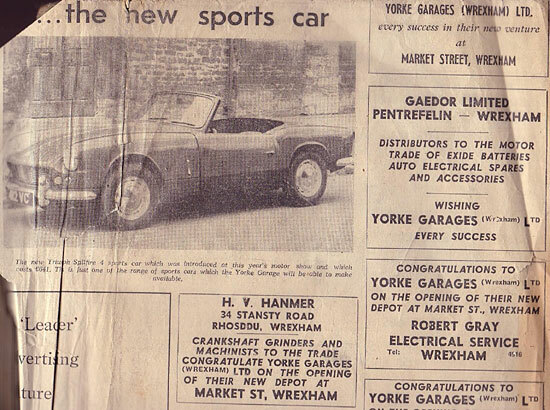 Yorke Garages was appointed the appointed Standard and Triumphs agent for Wrexham and later also specialised in Engine tuning and preparation of high performance cars. Les also had plans to make further acquisitions so as to be able to open up a separate foreign car sales agency, along with opening of an agency in the greater Manchester area. Yorke motors was awarded the Alfo Romeo agency. 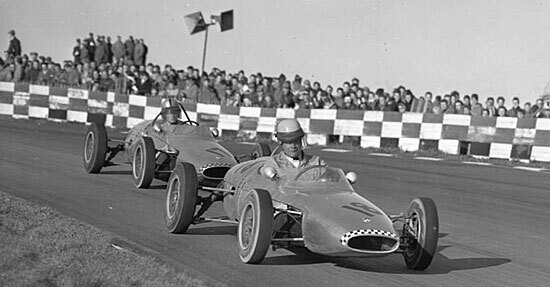 Les and Mike Cussons were intending to develop and race three cars in 1962; a Triumph Vitesse, an Aston Martin and the third was to be a two and half litre sports racing car to be designed by Les to compete in sports car races against Cooper Monaco’s and lotus. Perhaps Les ideas of racing were curtailed when he was involved in a head on crash on the public roads near Wolverhampton when he came upon three cars racing abreast. Les in an attempt to miss them went, up on the road verge to avoid them ,but the outside one went up the verge too, hitting Les car head on. Joyce’s new Triumph Spitfire sports car was a write off, the front bumper pushed up to the windscreen, with Les ending both feet through the floor. Les sustained broken ribs, cuts and damaged vocal cords, however against doctors and Joyce’s orders he discharged himself. Of course when he got home he was in agony when asked Joyce to help him turn over she told him he was big enough to discharge himself, he was big enough to turn himself over. Les always did what Joyce told him after that. By 1964 with Formula three having become quite popular Les had turned his attention to designing a car for the Formula but the Saturn was to be seen running at only two races in the May 18th Goodwood Parnell Trophy (6th) and June 6th Oulton BARC (8th) races in 1964 with Alister Welch at the wheel. The BMC engined car, possibly with an alloy body, whilst attractive, did not appear to be successful . Little is known of the car and few photos remain. These were busy and existing times for Les; along with the hard work that was involved in developing the now larger garage concern, Les was still designing Racing Cars. 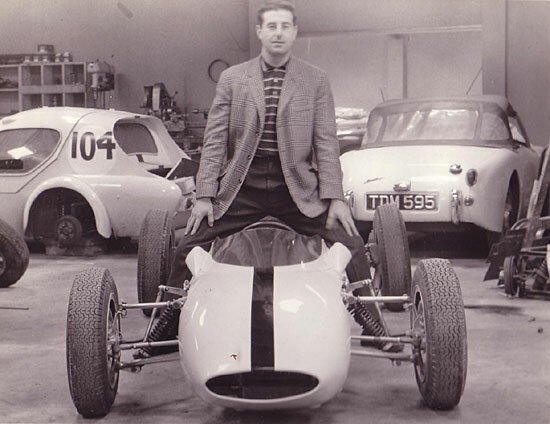 Whilst the sports car that he was designing for Nick Cussons and himself had to wait, Les’s reputation as a designer was such that after Yeoman Credit Team withdrew from Formula 1, Reg Parnell having set up his own Reg Parnell Racing in premises in Hounslow sought out Les and commissioned a design from him which was to be called the Parnell RP64. The car; a pencil thin design spanning only two foot wide at its widest point – four inches narrower than the winning Lotus F1 of the time, was of Monocoque design, with a rear mounted 1.5 litre BRM V8 and Hewland gearbox and Lotus pattern wheels. Les himself describe the car to the papers as being; “being virtually a large petrol tank with a hole in the front for the driver and one behind for the engine”. It has a double skinned body and the fuel is carried between the two layers. We have used the same principle as an aircraft wing”. Les’s partner in the Wrexham garage, Nick Cussons was also involved with the project as was the projects Co-director and No 1 driver, Motor cycling champion, Mike Hailwood. The plan was to run Hailwood in the F1 championship series, along with Chris Amon, at the time a 19 year-old youngster freshly arrived from New Zealand. The car was nearing completion during which the team boss Parnell became ill. Complaining of pain, he was taken from his house, Wallford house, Findern near Derby to the Derbyshire Royal Infirmary. An operation was performed though Parnell at the age of only 52 sadly passed away the following day from peritonitis after the routine appendix operation apparently went wrong. Parnell had been the first driver to win a race in a BRM. Parnell’s son Tim took over the team, but sadly the Parnell RP64 was never completed for F1, partially because of contractual problems with the engine supplier Climax. Later reports incorrectly suggest the RP64 was modified and became the Parnell BRM Sport Car. It’s doubtful one could take a monocoque chassis 4” narrower than the Lotus F1 of the day and convert it into a Sports car. There are reports and pictures on the Web of a Parnell F2 car that although resembling a Lotus, is a lot narrower. It’s a possibility that the RP64 chassis was used for what is the F2 car. 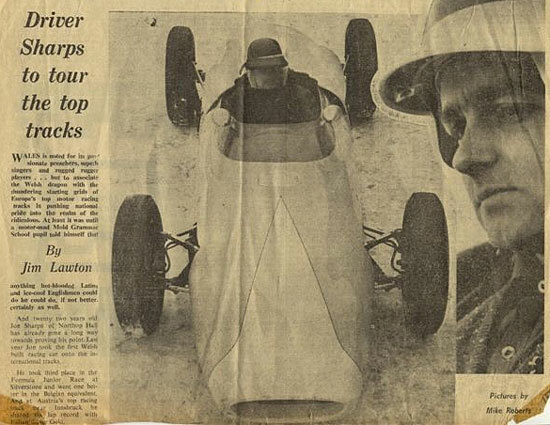 Indeed, Sport auto 1965, referred to “Parnell constructing F2 car, originally conceived as a F1 car by his father”. 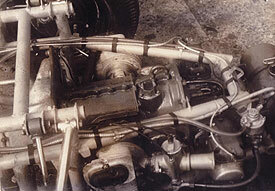 RP64 rear and 1.5 lt BRM V8 engine. With the RP64 project being mothballed, Tim Parnell instead acquired three Lotus 25’s for the 1964 with Les being commissioned to build an Aluminium bodied Sports racing car;the Parnell BRM. 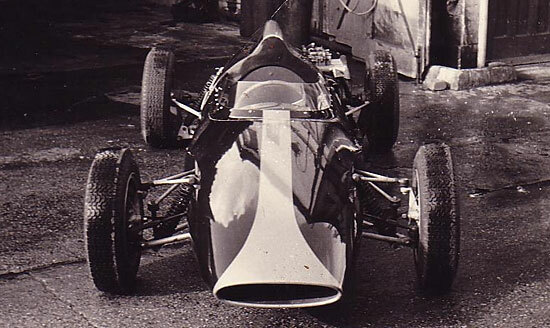 The car with rear mounted 2 litre normally aspirated BRM enjoyed success in 1966, in the hands of Mike Spence. Spence drove it to victory at Goodwood in the Lavant Cup. Spence went on to win the Anerley Trophy at Crystal Palace and finishing second at Silverstone in July. In 1968 Les offered his design of a ground effects car to Bruce McLaren racing which unfortunately was not accepted – Les commented “but therein lies a story”. but one we will possibly never know. 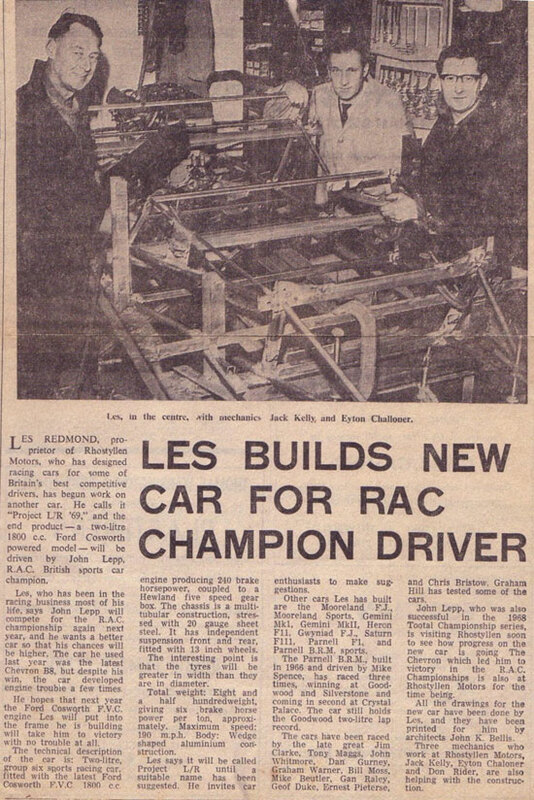 In 1969 Les again commissioned to design and build a further sports racing car , this time on behalf of John Lepp , the RAC British Sports car champion. Powered by an 1.8 litre Ford Cosworth FVC engine delivering 240 b.h.p, the engine was coupled to the 5 speed Hewland gearbox in a multi-tube space frame chassis strengthen by 20 gauge sheet steel. 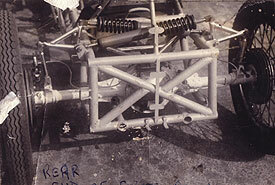 Attached to this was the all independent suspension with alloy body, again built by Williams & Pritchard. The wheels were 13″ all round and the width was greater than the diameter. The total weight was eight and a half hundred weight. The Spectre GP69 1970 as raced by John Lepp CR Les Redmond. Helping Les in the construction were three of his mechanics, Jack Kelly, Eyton Challenor and Don Rider who all worked at the Rhostyllen garage. The first outing for the Spectre GP69 was Crystal Palace in May 1970. It was the winner of the 2 litre race at Croft Autodrome setting fastest lap and new lap record. 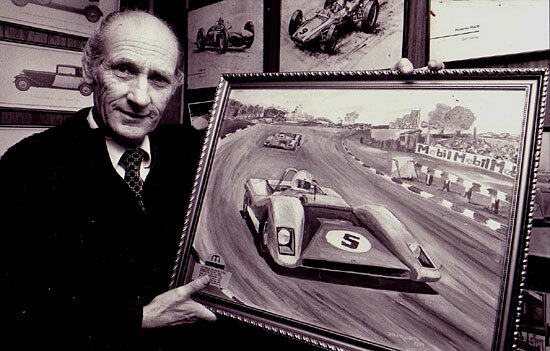 Les whilst surrounded for much of his life by Racing cars was primarily a designer and constructor, rather than a competitor. Having joined the North Wales Autograss club, Les was soon racing a Mini equipped with an eight port head and was quickly dominating the field. Racing was constrained for a while after being hit hard by another car and braking his neck, but within a year Les was back in another more potent car, became the Northern Champion and qualified for the British Championships. Obviously a talented engineer, Les had an impact on racing and not just in Formula junior with the Moorland and Gemini cars. Whilst the Spectre was Les’s last completed car design, Les was to continue to design right up to his death. One project he was working on was the design of an internal combustion engine with square pistons. Liverpool University had become interested but unfortunately many of the ideas passed on with Les passing for the project to be carried on with. Along with this project, Les was engaged also on the design and build of a futuristic two seater kit car of wooden construction. Les died of a heart attack at Wrexham North Wales in 1985 and is buried in the Church at Gresford on the outskirts of Wrexham. 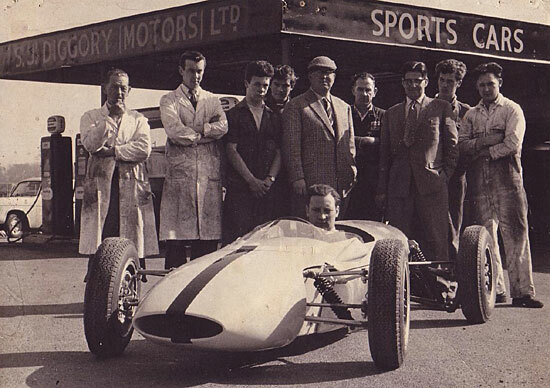 This page is dedicated to the memory of Les Redmond, for without him we would not have the beautiful and competitive Gemini Mk2 and Mk3 Formula Junior cars. Article written by Nigel Russell from research by Nigel Russell and Roger Herrick, Auckland NZ from period photos, Magazine and Newspaper articles and discussions with people who were there. A big thanks for photos, information and anecdotes from Les Redmond’s nephew and Chequered Flag employee Derek Taylor, London England, Les daughter Sandy Jones in Wales and Chequered Flag mechanic, Brad Ward of Wanganui NZ. John Greenwood, England for information on his Gwyniad and F3 car. All information contained in this website belongs to it’s original author. Any kind of reproduction, in whole or in part is expressly forbidden without the consent of the author. If you would like to use this information, please contact Nigel Russell. Photos courtesy and Copyright of the named parties.This information is gathered from various sources. It is used in good faith for informative purposes.